These rules have been drawn up, by the Executive Committee, for the safety of all persons and the smooth running of the Club. They apply to all members, their families, friends and guests using the Club's facilities, any disregard or non compliance with these rules may lead to the expulsion of the member. ● All craft must carry an efficient and recognised buoyancy aid or life jacket for each person on the craft or being towed by the craft. ● All craft must carry at least one anchor and rope of sufficient length to hold the craft safely. (A minimum length of 100ft is accepted by this Club but generally a length of 5 times the working depth of water is recommended along with a substantial chain the same length as the craft where practicable). ● All craft must carry two paddles, oars or secondary means of propulsion. Jet skis must also carry at least one suitable paddle and a length of rope for towing purposes. ● All craft must carry a minimum of two hand held red flares and two hand held orange smokes (an INSHORE PACK). All items are required to be in date. ● All craft must have, securely fixed and in a visible position, their current Club identification disc. (unless authorised otherwise by the Executive Committee). 1. Where a craft is in multiple ownership, the names of all the users will be required to be included on the certificate. 2. It is the members responsibility that anyone operating his craft is covered by adequate insurance. ● All craft must carry a sound warning device, either a whistle or foghorn. ● All jetski users must wear a recognised buoyancy aid whilst operating the craft. Wetsuits do not offer impact resistance and thus are not recognised in this instance. ● It is advised that each craft where possible carry a recognised and working fire extinguisher suitable for used on your craft. 1. The member must pay a registration fee for each craft. This entitles the member to a number for each craft and allows that member and parties named on the insurance for the craft if required to use the craft on the water. 1. The member may pay a single registration fee and have the same number on each craft but may only have 1 craft on the water at any time. ● All trailers must have the Club Identification Number boldly displayed on them. ● Trailers must suitable for the craft they are carrying and enable the users to launch and retrieve efficiently. Any trailers deemed to be unsuitable may be turned away from the slipway. ● The general rule is that trailers must be parked to the right of the slipway (descending). However, depending on the tidal situation trailers may be parked in the car park at the head of the slipway. ● A secondary fixing in addition to the winch must be used at all times. ● Current trailer regulations require a secondary breakaway chain to attach the trailer to the towing vehicle. • If parking at the clubhouse please park in the spaces marked in yellow. Please be considerate of others and also be aware that the tractors do use the driveway and need room to pass. • If parking at the beach carpark please ensure you display your membership card at all times to avoid being given a parking notice. ● Any member, their relatives, friends or guests found responsible for causing damage to, or theft of, the Club's property will be expelled from the Club and may be prosecuted. ● The leaving of rubbish, bait, or cleaning of fish around the Clubhouse and slipway is forbidden. ● The running of engines around the Clubhouse may only be done adjacent to the side of the clubhouse building, and only between 0800 hrs and 2000 hrs. The use of flushing 'muffs' is also prohibited unless you have a current generation quite engine. ● Jet Ski's are NOT ALLOWED to run their engines around the Clubhouse unless they are 4 stroke engines. ● Engines should never be revved. ● Before a tractor can be used the oil, water and fuel levels should be checked and filled as appropriate. ● The last member to use a tractor must return it to the Clubhouse garage and wash off the sand and salt water using the hose provided. ● The four wheel drive tractors may be taken into the water, BUT ONLY UP TO THE BALL HITCH at it’s lowest level. ● All paid up members holding a current full driving licence having the appropriate category, are allowed to drive the tractors. ● During Club activities, the tractor/ tractors are to be parked in the tractor bay in a safe manner. ● Due to the expansion of the mud area at low water and the risk of bogging down a tractor, no tractors are allowed to be taken passed the markers placed at the low water level of the beach. Drivers are reminded to keep to the right hand side of the beach (descending) to avoid the central mud patches. Should members wish to launch or retrieve at low water, past the marker, then it must be done by pushing the boat and trailer into the water by hand and recovery by pulling the boat and trailer out with a rope. ● In the unfortunate circumstance that you find yourself with a tractor that cannot be recovered from the beach it is your duty to attempt to recover the tractor and failing this contact a member of the committee who may be able to arrange a safe recovery before the tide returns. Contact numbers are on the top of the slipway. ● All drivers must exercise extreme care and reduce speed accordingly at all times. ● Members are not allowed to take their craft up to the Clubhouse and return the tractor to the slipway, other than the last person returning the tractor to the Clubhouse at the end of activities. Craft must be dropped off and taken to the Clubhouse with the members own vehicle. ● The slipway is the property of the Club and Environment Agency and non members using the slipway are trespassing. ● The only vehicles authorised to use the slipway are the Club's tractors and others authorised by the Executive Committee. ● When the slipway gate is opened, the lock must be securely fastened to the chain. ● The last member to use the Club facilities must ensure that the gate is properly chained and locked. ● The Full Members spouse/partner and any children under the age of 18 years can also use the Club's facilities and enter any activities arranged by the Club, but they are not allowed to launch or recover the Full Members craft without the member being present. ● When Members children reach the age of 18 should they wish to join as Full Members they can do so without paying a joining fee providing the membership is applied for at the 18th Birthday. ● Should a Member wish to have two craft on the water at the same time they must pay for two memberships and in addition have two different numbers to allow for identification should an incident occur? ● Should a Member no longer require a full membership they may retain membership to the club by transferring to an Associate Membership at the time their full membership lapses. Should full membership then be required the Associate may upgrade their membership by paying the current full membership fee, without paying a joining fee. However the Associate Membership does not allow the member to retain their boat number, During the period of Associate Membership the number may be reallocated. ● Where a craft is in multiple ownership and one of the owners decides to obtain their own craft. A registration fee will be payable. Who pays must be decided amongst those owners. ● All members must carry their Identification Card at all times when using the Club's facilities. ● Members must not use abusive behaviour or 'bad' language around the Clubhouse or slipway and consideration should be given to all neighbours and members of the public. ● All craft are to travel around the bay in an anti clockwise direction. THIS RULE APPLIES 2 HOURS EACH SIDE OF HIGH WATER. ● The anti clockwise rule also applies to all craft entering the area when ski-ing is taking place. Fishermen returning from being out at sea must enter the anti clockwise system and approach the beach accordingly whenever any other craft are using the bay. THIS RULE APPLIES 2 HOURS EACH SIDE OF HIGHDOES NOT APPLY AT LOW WATER . PLEASE BE AWARE OF THE REEF WHEN USING THE BAY AT LOW TIDES. ● Jet skiers are also required to comply with the anti clockwise rule within the activity area. Any tricks and turns should be performed in the area allotted for jet ski's unless you are the only craft on the water and must be at least 100 meters from the shore or a swimmer. ● Craft must not follow in the wake of a skier or towed object. ● Full throttle should not be engaged within 50 meters of the water's edge, except when a skier is starting from the beach. ● Craft drivers and/or observers must keep a sharp look out for swimmers and floating ski ropes, especially when less than 50 meters from the waters edge. ● All craft drivers must give right of way to other craft towing. ● No craft towing a skier must approach within 50 meters of the waters edge, and when bathers are present, consideration must he exercised by both drivers and skiers. ● Ski ropes must be pulled into the boat immediately after releasing the skier . ● During normal Club activities, an observer must be carried whilst towing a skier unless an adequate ski mirror is fitted. Jet Ski's are exempt from having an observer. 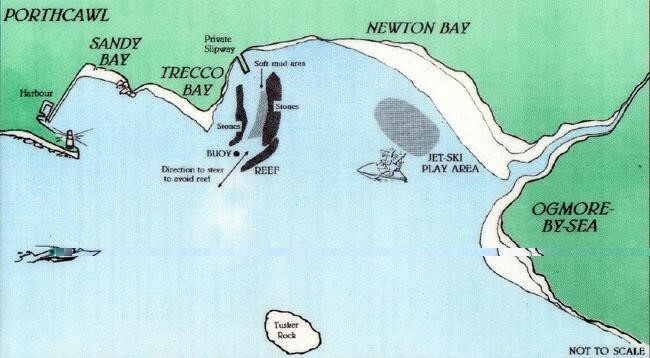 ● Boats and jet skiers must not use Sandy Bay, Trecco Bay and Rest Bay, for ski-ing etc. Entry to these beaches is banned except in an emergency. ● It is the responsibility of the Club Member, whose boat is being used with this Equipment to ensure that the following rules are carried out. ● All the equipment being used i.e. towrope, bridle, harness, rigging ropes parachute be up to all current regulatory standards. ● A responsible observer is in the boat at all times. Sufficient persons are available to ensure that the beach take off area is clear (min 4 persons). ● No persons, boats etc. be in front of the take off area (30 meters each side of the towrope). If necessary use prominent markers as a guide for the area of take off. ● The member must be conversant with the type of equipment being used. ● The member must give clear signals of his /her intentions to other craft. ● Everyone using the equipment are aware of all signals of intention required e.g. turning, landing etc..
● The landing area must be free from any other persons or craft. ● Due consideration must be given to other club members at all times. ● The member must have insurance to cover the use of the equipment and other persons. In addition to the standards already required by the Club. In the interest of common courtesy and common sense the following unwritten rules should also be taken into consideration. 1 Slow down when you are passing moored or anchored boats. 2 Before mooring alongside another craft ask if you can do so. 4 Don't pass too close to other craft, especially small open boats. 6 Do not enter Porthcawl marina / clubhouse unless you invited to do so by the harbour staff. LAUNCH AND RECOVERY AT LOW WATER. Fig 1 - Sketch of the beach indicating the danger areas and areas where safe launching and recovering can take place. If members find it necessary to launch or recover their boats at low water they must remember that the hard packed sand occurs only on the right hand side of the beach (looking at the slipway) and further down the beach the waters edge the closer to the stones on the right It is necessary to go. NOT TO DO SO RISKS BOGGING DOWN THE TRACTOR. The Club has placed a buoy at the bottom of the beach and this indicates the end of the stones on the right hand side of the beach and launched boats should proceed out to sea and keep that buoy on their starboard (right) side and can pass fairly close to it. DO NOT PASS ON THE PORT (LEFT) SIDE, otherwise you risk hitting submerged stones. At low water the reef can be seen where waves break over it and the deepest channel runs more or less parallel with the shore for about 100metres from the buoy. When the reef is passed boats can take any direction they wish. ALL MEMBERS CARRYING ECHO SOUNDERS ARE STRONGLY ADVISED TO HAVE THEM ON AND WORKING WHILST PASSING THROUGH THAT AREA. When approaching from the seaward side boats should approach with the buoy on their port (left) side and watch where the waves rise up and break. that will indicate the position of the reef. Avoid "WHITE WATER'. The advice given is obviously subject to tidal and seasonal variations and members are recommended to take all possible care when approaching or leaving the beach at low water. 1. ALWAYS STICK WITHIN 10 METERS OF THE ROCKS TO THE RIGHT HAND SIDE OF THE BEACH (as seen from the slipway). 3. KEEP AWAY PROM ANY BREAKING WAVES AS THEY WILL INDICATE SHALLOW WATER.